We now have a three- and a one-year-old in the house as of a week ago. Two toddlers…OMG, save me. It’s loud, and crazy, and some nights cereal or smoothies for dinner feels like a major culinary accomplishment. But, oh, do I adore my little monsters and this crazy family. Can I cut out an ingredient (or four) while still enjoying the dish? Is this step absolutely necessary to the overall dish? Why is there so much screaming going on? If I do something the night before, will it save time the next day? Adriana, can you please stop tackling your brother like a football!? Lol. And probably one of the questions I ask the most: Why is there no OSG delivery service yet, damnit!? 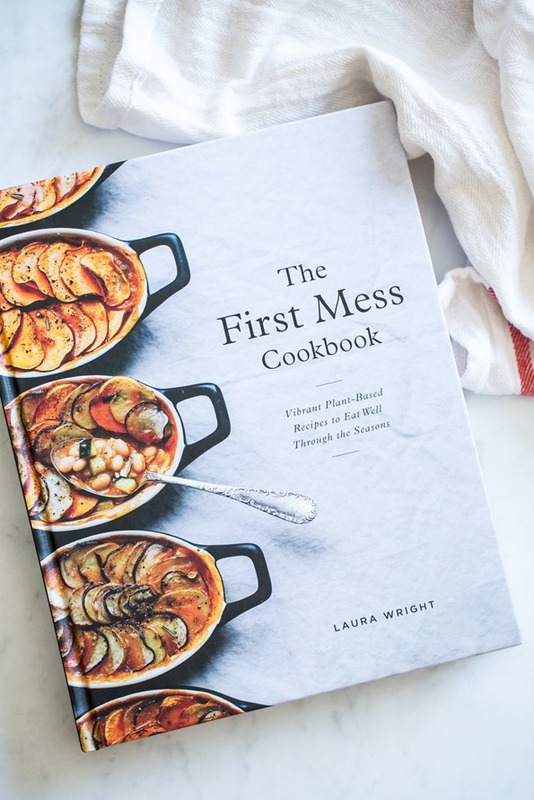 If you follow me on Insta Stories, you may have seen how excited I was to dig into Laura’s beautiful plant-based cookbook, The First Mess Cookbook, this past spring. I’ve been following Laura for years (#TFMfangurrrrrl); she’s a seriously talented writer, photographer, and cook. I’m constantly amazed by the beauty she captures in her food, and the warmth and passion with which she shares it. Laura is one of those cooks who seems to truly adore the process of cooking. I personally don’t always enjoy the process (real talk: sometimes I loathe cooking), and often don’t slow down enough to find it uber-relaxing, but Laura has a way of inspiring a certain intention and gratitude for the process. I love that. Her plant-based recipes and photographs are truly works of art, and I’m so glad she shares them with us all. Her cookbook would be a delicious addition to your collection if you don’t have it already! 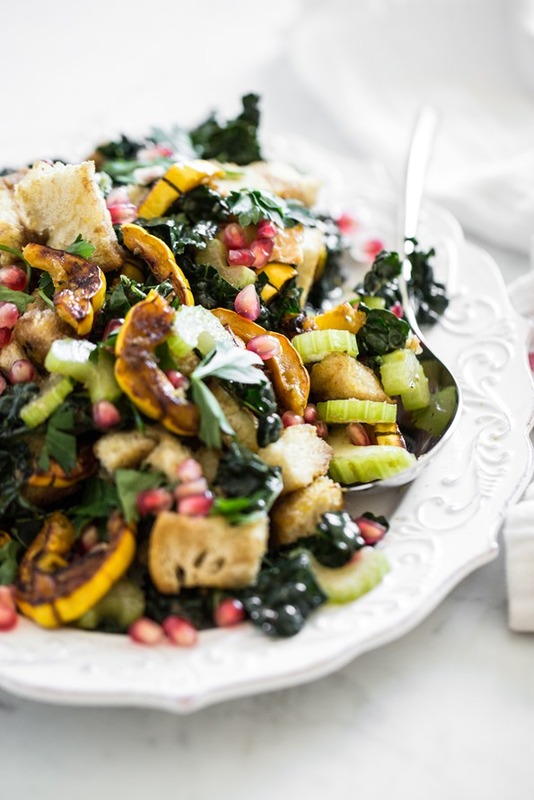 Months ago, I made a mental note to make the Thanksgiving Panzanella, and I couldn’t wait to make it once the cooler temperatures had set in. Because the recipe has quite a few steps, I started it the day before, and ended up creating a fun, make-ahead version. As you can tell, I’m all about make-ahead situations these days! By doing most of the prep work in advance, it became a practical option for our Thanksgiving meal. 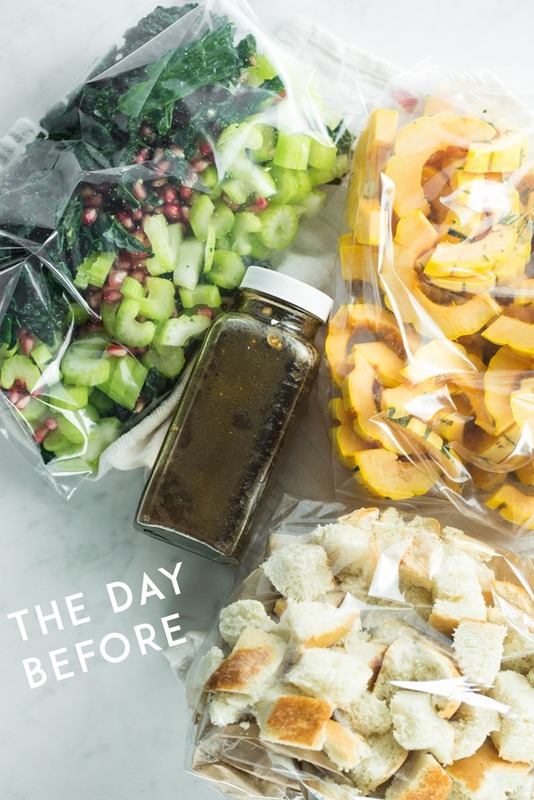 The prep work the day before is a half hour (and it’s a bit kitchen-destroying, tbh), but the next day, the effortless prep will only set you back a mere 10 minutes. Pretty sweet, huh?! Oh, and it’s a looker. And tasty…duh. As my hilarious recipe tester, Nicole, wrote, “Yield: 6 side servings or one big serving for me ha ha ha!” LOL! Love her. 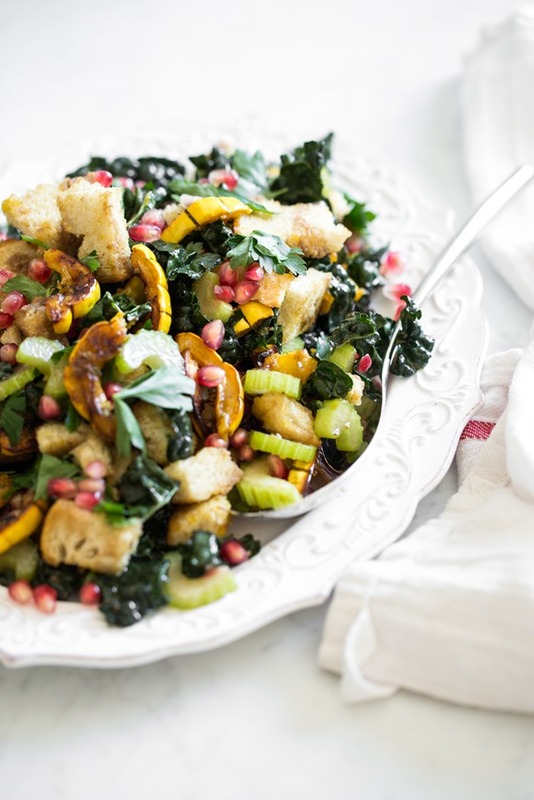 Since this is quite an involved recipe, I like to prepare a few aspects of this panzanella the day before to save time and mess on the day of a special event, such as Thanksgiving. By doing a bit of advance prep (about 30 minutes the day before), all you have to do on the day is bake the squash and bread, then toss it all together just before serving. I like to serve this recipe warm, so I time the cooking so that the squash and bread come out of the oven just before our planned mealtime. 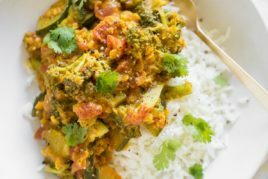 This recipe is adapted from The First Mess Cookbook (2017) by Laura Wright. Reprinted by permission of Penguin Canada, a division of Penguin Random House Canada Limited. The day before (steps 1-4): Make the dressing: In a small jar, place the balsamic vinegar, minced garlic, maple syrup, Dijon mustard, olive oil, salt, and pepper. Screw on the lid and shake to combine. Chill in the fridge. Slice the sourdough bread into 1-inch cubes until you have 4 cups. Place into a large bag or container and leave it on the counter. Slice each squash down the middle, lengthwise. With a spoon, scrape out all of the seeds and discard them. Slice the squash into 1/4-inch “half-moon” slices, and place them into a large zip bag, bowl, or container. Mince the rosemary and thyme and add it to the squash. Chill the squash and herbs in the fridge (covering, if necessary). 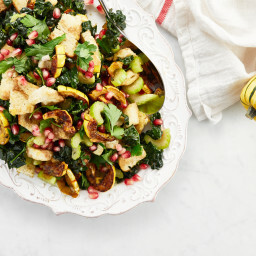 In a separate zip bag or container, place the sliced kale, chopped celery, and pomegranate seeds. Chill in the fridge (covering, if necessary). The next day (steps 5-8): About 15 minutes before you begin, remove the dressing and squash from the fridge and place them on the counter so that they can come to room temperature. Position two racks near the centre of the oven. Preheat the oven to 400°F (200°C), and line two extra-large baking sheets with parchment paper. While the squash is roasting, spread the cubed sourdough onto the remaining baking sheet and toss it in a couple teaspoons of oil. When you have 10 to 15 minutes left of the squash’s roasting time, place the sourdough in the oven with the squash and continue roasting for 10 to 15 minutes. The bread should feel lightly toasted when it’s ready, but it shouldn’t look brown. 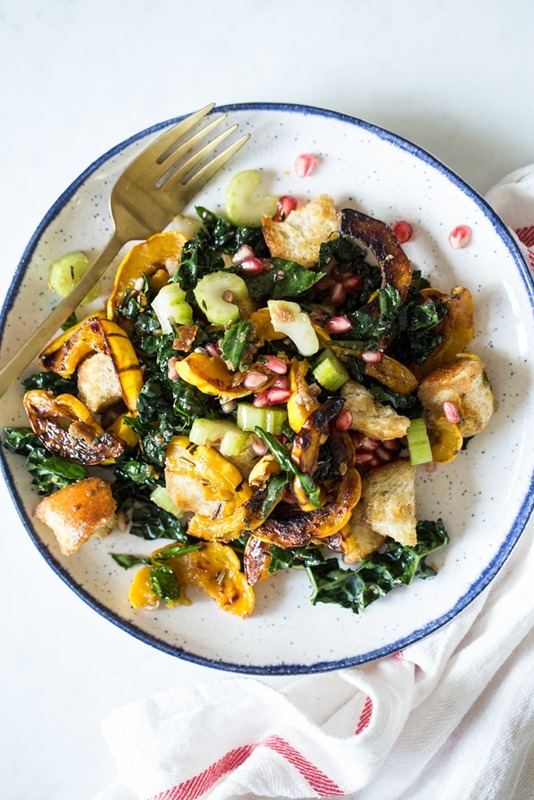 While the squash and sourdough are roasting, place the kale, celery, pomegranate seeds, and dressing into a large serving bowl. 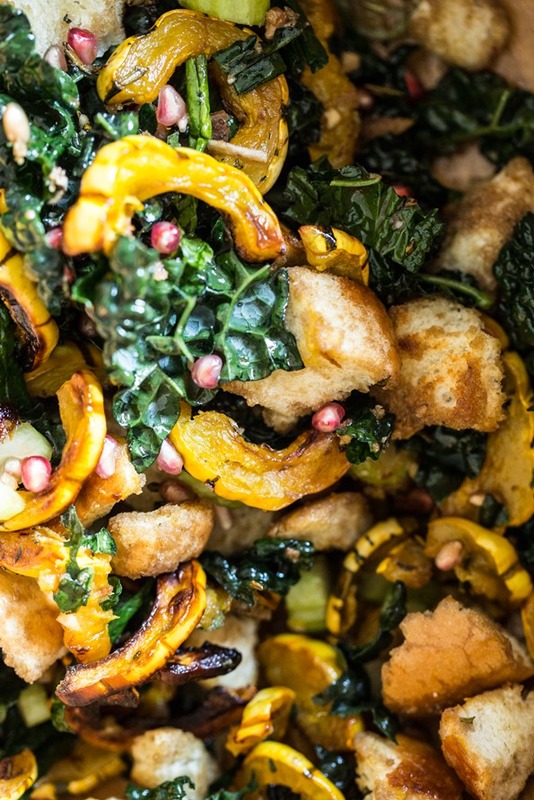 When the squash and bread are finished cooking, add them into the bowl, and toss well, until combined. Season the panzanella with more salt, to taste, if desired. Serve warm with a garnish of celery or parsley leaves scattered on top. This recipe is best enjoyed immediately, or within a couple of hours of preparing. On the cusp of our Canadian Thanksgiving weekend, THANK YOU for your amazing love and support, even when this blog is a virtual ghost town. I’ve been chipping away at some big behind-the-scenes blog changes and can’t wait to share more. Also, Eric recently started a new career venture, which has been wild. I’m thrilled for him, and grateful to be able to return the support and encouragement that he’s given me all these years. But, holy hell have we been struggling to stay afloat. The juggle of parenthood and “careerhood” is no easy feat. I’ve been trying to make it work with a lot more on my plate. Some days I feel like I’m doing a crappy job at everything, and other days, I feel like I’m killing it. We’ll get into a groove…it just takes some trial and error. Just know that I love and appreciate your support more than you know. I hope my fellow Canadians have a relaxing and delicious Thanksgiving weekend with loved ones, and if you try out this recipe, I hope you enjoy it—and my make-ahead tricks—as much as we do. I’ve also added this recipe to The Oh She Glows Recipe App, so keep your eyes peeled for it on there. Last but not least, I’d like to pass along Arlo’s nursery tour over on HGTV! It was so much fun (and such an honour) to be featured. (Just know that the nursery never looks this put together in real life….it actually looks like a tornado blew through it most days.) A special thanks to the lovely Brittany Devenyi for the feature! I love a recipe that can be made ahead of time, especially at Thanksgiving! This looks so delicious yet nutritious. I think I agree with your taste tester – one biggooooo serving for this lady. The rest of those fools can eat turkey. I definitely came close to eating a whole batch during one of my tests. It’s just too good! It really is ideal as a make ahead recipe…I played music on the radio as I chopped away at the veggies, popped it all into freezer bags and put them in the fridge to finish up the next day. 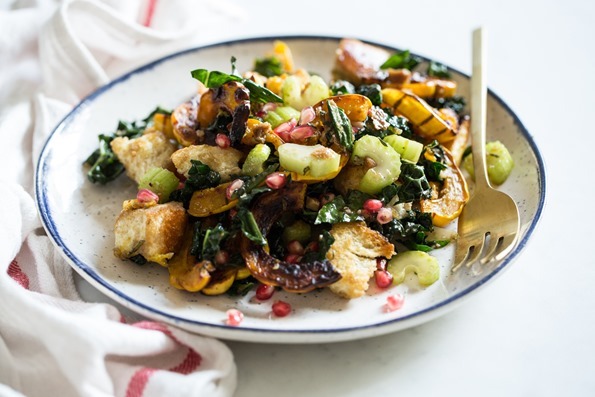 The next day, which was filled with children, surprise rainfall and and a bit of a tension headache, I had a “dinner made simple” by popping the squash in to roast and pouring the dressing onto the salad. Thanks so much, Angela, for timing it all out so perfectly! So happy you enjoyed it! Thanks again for your helpful feedback and suggestions. :) I agree that it’s so nice to have ready to go. I love the comment you made about smoothies or cereal for dinner some nights! I did that very thing a few days ago on a particularly frantic evening … the Pink Power Detox Smoothie + Sunwarrior protein powder from your app served as my lunch and my dinner. Then today, being a busy and slightly crazy PA Day, had me drinking (an entire) Reset -Button Smoothie from Oh She Glows Everyday…yup, the family sized one, all to myself as fuel for the day! They were definitely delicious and got me through! Okay, THAT was amazing!! I made a few tweaks. I couldn’t find delicata squash anywhere, but when I Google’d it, apparently butternut squash was a good replacement. And it was. I happened to have reduced balsamic vinegar and used that in the dressing — whoa! For the oil that was added to the bread cubes, I made a little concoction with garlic powder and S&P. Except for the kale/celery/pomegrante/dressing portion, I kept everything else separate, until I served it. I only put whatever would fit my serving bowl … and I was heavy on the dressing. Keeping the rest of the ingredients separate kept the bread from getting soggy. And it’s easy to throw together if needed later, like second helpings. I recommend you cut the squash and bread small, like Angela’s. Prep time was much longer, so listen to Angela’s suggestion to make ahead. I served this with a Greek salad and Morning Star Blackbean burger patties from Costco. *Muah* the whole meal was a hit with my 17-22 year old crowd, especially the panzanella. Hi Chrissie, Wow you made it already, and I LOVE your tweaks to the recipe!! Don’t you love when something is so versatile? I too was thinking butternut squash would be a good one to try….so glad to hear that it worked so well. I’ll have to try that next time! Oh gosh this looks absolutely amazing! 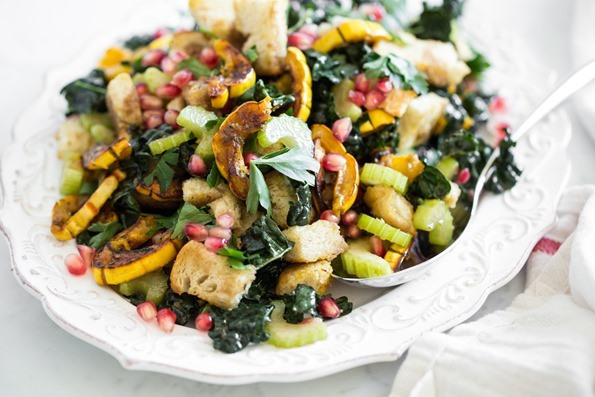 so perfect for thanksgivings amidst all the unhealthy options that are usually prepared! Angela, as a long time reader (been reading since your very first Halloween post 10? 11? years ago). I come to your site every few weeks looking for a new post. I came here yesterday (and the tab is still open) as I had previously googled “Thanksgiving salads”, and then remembered you have some really good ones (Festive Kale Salad with Sweet Apple-Cinnamon Vinaigrette & Pecan Parmesan). I was going to peruse your archives when I was pleasantly surprised to see this new salad recipe posted! You read my mind. It looks amazing but unfortunately I won’t have time to make it for tomorrow, we have 4 and 2 year old boys and never enough time in our day. Haha. Another time though! Thank you for linking your nursery pictures. I am in love with the honeycomb wall shelves! I’m going to ask my husband if he would pretty please make them for our boy’s rooms. Your designs look effortless and beautiful. Although I have to wonder if you’ve switched to blackout curtains. Haha. Hi Hayley, Thanks for your sweet note! I’m sorry this recipe didn’t find you in time for your Thanksgiving meal, but hopefully you can enjoy it sometime soon. :) It’s a nice stick to your ribs fall/winter recipe. You are right, we don’t have blackout curtains, but there is an accordion-style pull down blind at the very top of the window (which I don’t think you can see in the pictures). Good luck with your boy’s room designing! I love, love, love this. Sourdough bread is just so good even when a little bit old, great idea to use leftovers. And I didn’t know this cookbook, it looks really appealing. Happy Thanksgiving! I’m also a mother of two toddlers (also 1 and 3, although they’re very close to 2 and 4) and know so well the complete chaos that goes along with that. Most days my home looks like a FEMA zone. I would LOVE to hear what tips and tricks you’ve come up with for easier cooking. Also, do you have more kid-friendly recipes? Both of mine sweeties have become very picky eaters! The picky stage is a hard one! Luckily Arlo is still eating everything, but I know his picky toddler stage is probably looming, lol. Adriana is still going through it…some days she’ll eat everything and other days it’s a struggle and she will barely touch her fave foods. 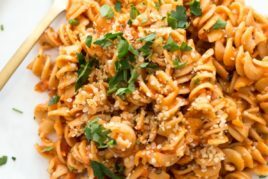 Have you tried my recipe for Adriana’s Fave 10 Minute Pasta? That always tends to be a hit around here. I made this today (all in one day as I ran out of time to make ahead). It was the only Thansgiving dinner dish my husband had THREE helpings of … and he’s not vegan. Thank you for this. It will go into heavy rotation at our house. Couldn’t find pomegranates so substituted some chopped fresh cranberries. Delish. Hey Maureen, Oh what great news!! So happy your husband was such a fan, too. Three servings is always a good indicator of a recipe hit, haha. I’ll have to try it with cranberries next time. Happy Thanksgiving! I can’t stand the taste of celery. Can I substitute it with something else? I can’t see why not :) Maybe roasted onion or carrot might be nice? This was a gorgeous Thanksgiving side dish, and I’m definitely going to make it for a main one night too. It was delicious. Great tip on the advanced prep. Hey Kendra, So happy to hear that you added this to your Thanksgiving line-up and that it was a success. :) I agree, the advance prep is a lifesaver. I think I need to try this with more of my recipes. Happy belated Thanksgiving! I’ve definitely bookmarked this for our November Thanksgiving; it looks truly delicious. Thank you! Hope your Thanksgiving was (crazy) happy! I hope you enjoy it if you end up making it for your Thanksgiving. My wheels are turning with other make-ahead options now. Yes, I really want to make this and perhaps may before Thanksgiving. I really know what life is like with little one’s. They are adorable, but life can get a little crazy–hope you’re able to get some “me” time. Also, best of luck to Eric and his new career adventure. Thank you for sharing, including your gift for cooking, Angela! Thank you Margaret! 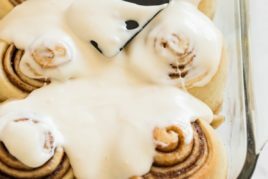 I hope if you make this recipe you love it as much as we do! Nothing like some crusty sourdough bread to comfort during the fall months. This is a truly delicious and mouth-watering dish! Is it possible to use honey rather than maple syrup, Angela? Really liked the photos of the nursery. It’s a great theme! and put together so lovely! I love the little yellow half-moon dream catcher! I was looking for it online but couldn’t find it anywhere. Did you make it yourself? 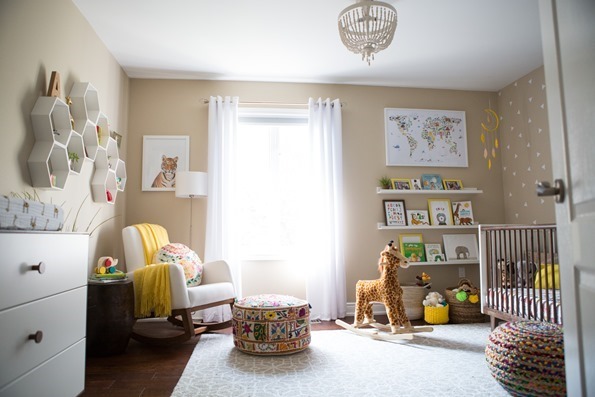 Hey Sabrina, Thank you so much for the kind words about the nursery! The dream catcher was a custom order on Etsy. The shop is called “rainbowsmileshop” Hope this helps! My child really enjoyed your recipe. It is wonderful. Hope to see more recipes. What a beautiful dish! It’s an amazing idea for a potluck. This was amazing- sharing the recipe with family and friends! Angela, The new recipe looks really good and healthy. I wanted to thank you for sharing pics of your son’s room, it’s adorable. I love your the animal-nature theme. Sorry for the typo– meant to say ‘I love your design, the animal-nature theme” …… guess I need to preview post next time. So awesome – make ahead recipes help so much, and this looks great! What would be an acceptable substitute for sourdough? I’m eager to make this but it’s the one kind of bread my husband doesn’t like…. Hey Melissa, I think any homemade bread loaf that you both enjoy could work. A traditional French loaf might be nice? Just made this as a main dish as I wanted something seasonal and hearty and I loved it! This will be my go to for holiday potlucks this year. Thanks so much for always coming up with such fantastic recipes! I’m so happy you love it so much Celeste! It’s a new go-to for us too. Wow! This looks amazing! I can’t wait to try it. Wow, does this look fantastic! My Mom doesn’t want “another salad” at Thanksgiving, but since this is served warm, I’m going to throw it in my big lasagne dish, double the recipe, and throw the Avocado alioli from your Crispy Smashed potatoes on top. 😬Salad? I don’t see a salad? Thank you, Angela for the make-ahead tips: I’m even buying some stuff now and freezing (Pomegranite arils, anyone?) and buyng the delicata so I even save the grocery store madness (it will store well in the cool cellar)! This is easily adaptable for those of us who need Gluten-Free: I’m toasting GF bread for myself and sourdough for my family. One can choose whch bowl of bread to mix in to their “casserole” on their plate. Cheers! Kathy, I love your ideas!! Thanks for sharing. Who knew that pom arils froze well! Great dish! I’m taking it to Pot Lucks over the Holidays, and will be serving it at Christmas too – love it! Angela – I made a batch this weekend to try it out for 16 family members coming for Thanksgiving. It is just delightful! It’s a gorgeous salad not too heavy to serve as a first course. The dressing pairs so well with the kale. This is going to be such a big hit. Thank you!! Hey Laura, Oh what a great idea to do a test run! I’m so happy to hear it was a big hit…I’ll be making it again at Christmas…can’t wait. Can you recommend a good clean dijon mustard brand? Thanks! Hey Sydney, I use Simply Natural brand most often! How do you think this would be without the bread? Considering making it for thanksgiving, but already have lots of starchy sides. Thanks! Hey Lindsay, The bread is one of my favourite parts about it, hah. I don’t tend to have sourdough often so I was in heaven! That said, you could probably add other veggies in its place and it would still turn out okay. i made this Panzanella for Thanksgiving 2017! It is absolutely fabulous. The delicata added the perfect compliment to the kale. Everything about it was perfect and the gluten free peasant loaf worked prefect. I wish people wouldn’t comment on how good things look and they can’t wait to try it… I wish comments were limited to those that actually MADE the recipe and had any positive or negative feedback. Hi Kim, I’m so happy you love the recipe! Great to hear that it worked with a GF loaf too. And thanks for the comment feedback. One quick way to scan recipe reviews is to look for the comments with the “star rating”. Those are comments where the reader is reviewing the recipe. Occasionally, someone will review it with a star rating without having tried it yet, but I try to remove those ones. Hope this helps! This is so good! What would you serve it with? 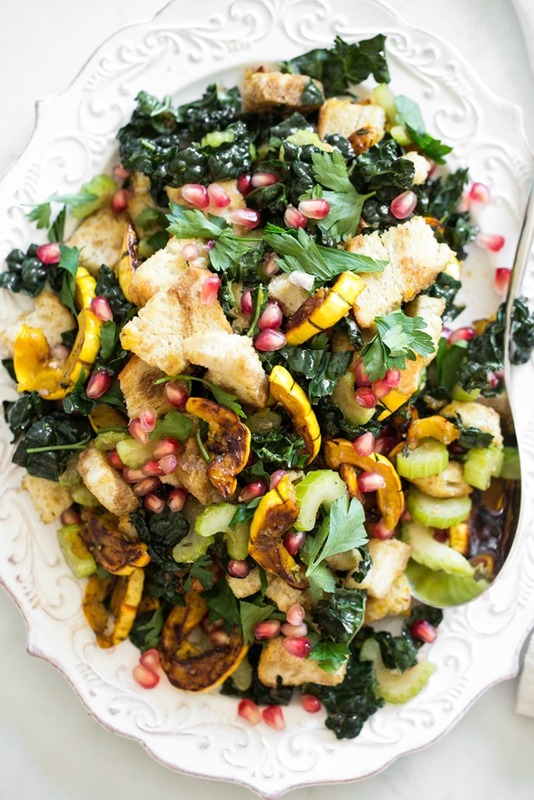 I would love to read menu ideas too that include this panzanella. I’m thinking falafels or bean/seed burgers might go well. I’ve been visiting your site for years, and this is on my top five list of favorite recipes. Thank you many times over for your hours of dedication in the kitchen. I made this with a roasted garlic sourdough loaf from the local bakery… delish! Thank you so much for the love! I’m so honoured you’ve been visiting for so many years. Thanks for your support! ps- Roasted garlic sounds like a wonderful addition too. I was thinking it would be an easy addition since you have to roast the squash anyway! I made this for a large Christmas Eve dinner last night and it was a huge hit. Delicious for the two vegans and the many meat eaters alike! Hey Jamie, So happy to hear that! It’s one of those recipes that goes fast. 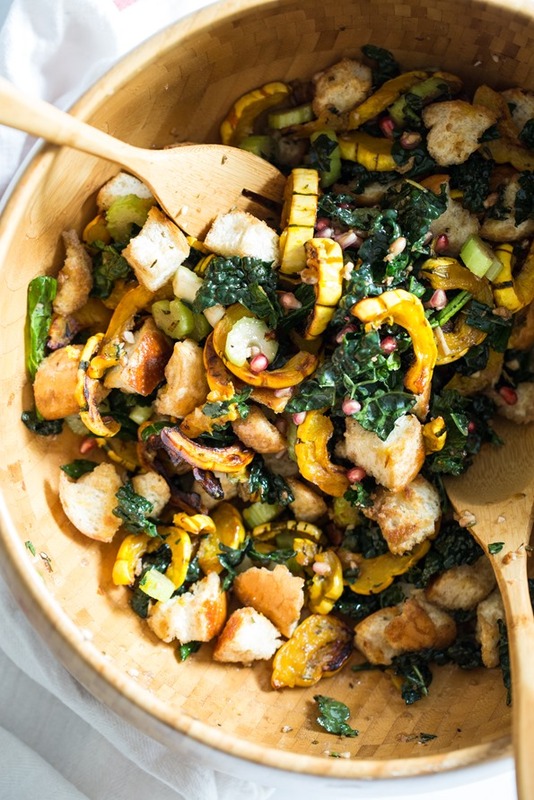 I love a good panzanella salad, so glad to see one that was winter-friendly! I couldn’t find the squash listed, so I used acorn, and I just missed pomegranates, so I used dried cranberries. Overall, I thought was delicious! I didn’t love the flavor of the acorn squash with it, so if I come across the intended squash I’ll try it again. Oddly, I always like the salad the next day, when the croutons have had a chance to soak up some of the dressing. My husband liked this one, so that’s a win, but the kids didn’t. Next post: Ultimate flourless brownies for two + Cookbook news!